The people of Earth are suddenly faced with the fact that worlds other than their own exist, and they're not friendly. An invading force with advanced technology called Neighbors, have threatened to overrun and conquer the world. Luckily, an organization named Border was established to stop them. They have set up a base of operations in Mikado City near the gate that acts as entry point of Neighbors. 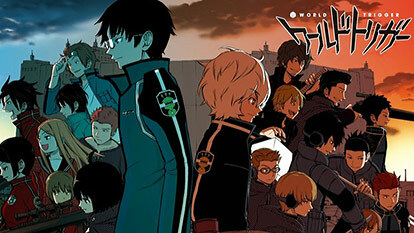 In the action sci-fi anime World Trigger, middle-school student Osamu Mikumo meets mysterious transferee Yuuma Kuga four and a half years after the appearance of the gate. Osamu, who’s secretly a Border member in training, finds out that Yuuma is not your typical student either.